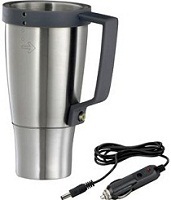 Next time you stop for a break after driving, make sure you top up your favourite cup of hot chocolate tea or the recommended coffee and pour it into our Custom Isolating Car Mugs for constant warmth using the 12 volt adapter supplied. Stainless steel and hard wearing, our personalised logo branding of your Company's crest can be made possible, displaying and exposing your brand-name for excellent brand-awareness. Hand out a batch of these Custom Isolating Car Mugs and associate your branding with the customer's favourite hot beverage! For a FREE QUOTE, please fill in the form regarding our Custom Isolating Car Mugs and we'll be able to help you.